Oil & Vinegar is a standard. But Oil & Honey? 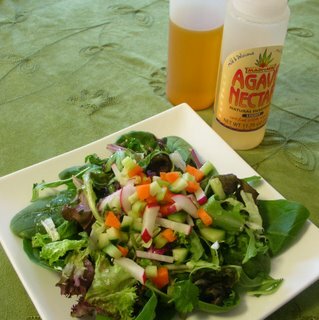 Oil & Honey is the new favorite salad dressing at Diva Marketing, inspired by last month's Zucchini Lemon-Honey Salad. I had to try it! Toby drizzles olive oil and honey on salad greens. I went a half-step further by misting -- vs drizzling -- the greens with good olive oil, then swirling maybe a half tablespoon of agave nectar over top, then seasoning with salt and pepper. My report? It's not only very easy -- it's very good, definitely a new standby. What is agave nectar? It's the plant-based vegan substitute for honey, also a baker's substitute for refined sugar. And Shake off the Sugar reports that agave nectar has a low-glycemic index so is good for low-carb diets. My only challenge is to not mix up agave nectar with the dog's flax seed oil (on the left)! FROM THE ARCHIVES ... The Recipe Box has other ideas for green salads but be sure not to miss the Celery & Apple Salad and the Napa Cabbage, Herb & Mango Salad with Asian Dressing. I've got to try this. I'm thinking Wild Oats might have agave nectar? I gotta give the oil and honey mixture a try. Especially the misting. I bought a can of the Mazola Pure Olive Oil flavor (is it a flavor or an olive oil, I wonder?) and will try that with a bit of honey. I have some spinach waiting to be eaten. This sounds like a dressing I need to try for a Salad Sunday, although I probably stick to honey as it's something I love. Actually, your blog has lots of inspirational ideas for salad-phobes! Flax seed oil is wonderful stuff, isn't it? I swear by it for keeping Milo's coat so lustrous. Alanna - what a kick ... my first foodie idea on a blog and to borrow from Mikey "they liked it." Now I must try misting. Thanks!